As the UK welcomes World Poetry Day (Thursday 21 March 2019), Go North East is taking specially-commissioned verse on the road, as part of a creative project to promote inclusivity amongst residents. ​A double decker bus affectionately named 'Ozzie' in a public poll has been transformed into a charity shop on wheels, thanks to a donation from Go North East. ​Two rising star apprentices at Go North East swapped roles with senior staff at Gateshead College last week, in a ‘day in the life’ experience to mark National Apprenticeship Week (4 - 8 March 2019). The bus company is launching a quirky new solution to the age-old problem of people putting their feet up on rear facing bus seats. 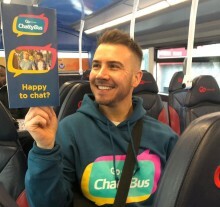 ​From 24 March 2019, there will be changes to some services in North Tyneside.